Thomas Bendish matriculated from St John's in 1624, before being admitted to the Middle Temple in 1626. Owing to his support for the King on the outbreak of the Civil Wars, he was imprisoned in the Tower of London and his estates sequestered. On his release he was fined and banished from his native Essex, before experiencing an upturn in his career in 1647, when he was appointed Ambassador to the Ottoman Empire. On his arrival in Istanbul his predecessor refused to relinquish his position and had to be forcibly ejected. As Ambassador, Bendish spent time dealing with factionalism and corruption in the Levant Company, purchasing and freeing English slaves, as well as using gunboats to extract capitulations or trading privileges from the Sultan. Bendish survived several attempts to replace him, the drowning of his son at sea, the death of his wife from plague, and his own imprisonment by the Ottomans, when he clashed with one of the clerical hierarchy over a commercial matter. Bendish's tenure finally ended when Charles II ascended the throne, and he was replaced by the Earl of Winchilsea. Bendish returned home and spent the last years of his life involved in a protracted dispute over expenses with the Levant Company. Some forty items in the Library bear Bendish's provenance, although he is recorded as having given fifty. These cover a wide variety of subjects, but with particular emphasis on the sciences and applied mathematics. The topics covered include anatomy (e.g. the 2nd edition of Crooke's Mikrokosmographia, 1631), timekeeping (e.g. Schoener's Gnomonice libri tres, 1562), drawing and perspective (e.g. a contemporary edition of a work by Durer from 1535), mechanics, and there are numerous other works on astronomy and geometry, as well as Olaus Magnus' illustrated history of the northern peoples (1567). There is one item of incunabula: a French edition of Thomas Brawardine's Geometria speculativa, with diagrams, from 1495. 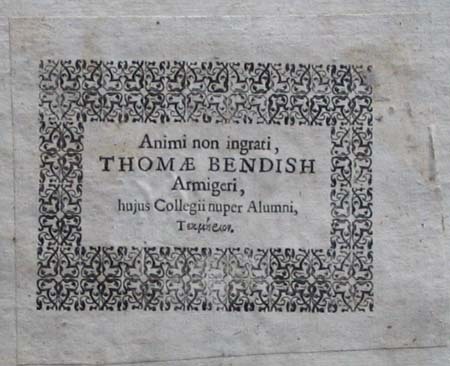 A token of the grateful heart of Thomas Bendish Esquire, late alumnus of this College.